I’d originally bought these large stuffed SEAL PUPS on sale more than a decade ago with the intention of using them as gifts. It was an after-Christmas sale, which is the reason they’re wearing red plaid bows around their necks. At the time, I’d figured that I could change the bows to whatever appropriate occasion I might decide to give each of these SEAL PUPS as a gift. Maybe pink or blue for a Baby Shower or 1st Birthday, or even bright red ribbon for Valentine’s Day. My good intentions got waylaid tho because somehow these little fellas became a part of my bedroom decor! We tend to move around a LOT. I have antique furniture in my own bedroom in which I am the 5th generation to be using. For some reason unknown to me, during one of these moves, my son just kinda stuffed these 3-feet long SEALS under my chest-of-drawers to get them out of the way while we were trying to decide what-goes-where in my bedroom. 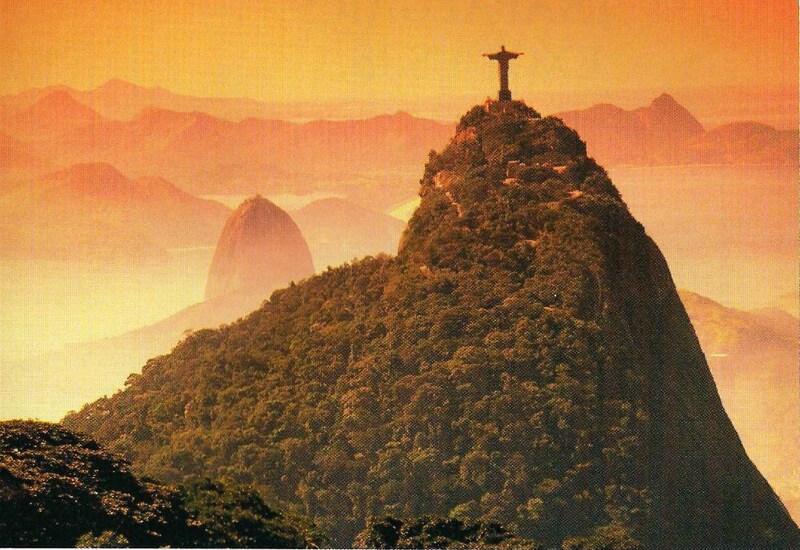 Their heads were sticking out, as in the photo, and we all just rather got used to seeing them thataway! I have tried putting them on my bed before but they’re much too large. I’ve put them other places but they’re still much too large. Babies have been born, and then had their 1st birthdays….but nope! I still have NOT given them away as gifts as was my original intent. I LIKE THEM NOW! They seem to belong under my chest-of-drawers, in my bedroom. So I reckon that’s where they’re gonna stay. My little nieces used to lay on them while watching TV whenever they’d visit. Those girls are teens now. Maybe someday I’ll have grandbabies that’ll like to sit on them and I am imagining that there will be many stains to be gotten on the pups at that time. Like me, they won’t last forever but we are getting a lot of enjoyment out of them! So we have continued to move several times since I’ve bought the SEAL PUPS, and they’re starting to get a few ‘age spots‘ (just like me) but that’s okay. My adult kids are very used to moving, they are ‘Air Force brats’ after all, that they’re rather adept at packing and unpacking. They can ‘put together a room‘ quickly. They know their old Mama very well, too. If’n I tell them which bedroom will be mine, I can betcha that the 3 of them would probably know exactly where I would place each piece of furniture before even asking me! Also, they’d know which quilts to put on my bed and in which order. My youngest child has ‘the eye’ for decoration, so he usually arranges my Indian vases and photo frames upon my dresser while my daughter arranges the array of hardback books in the bookcases. 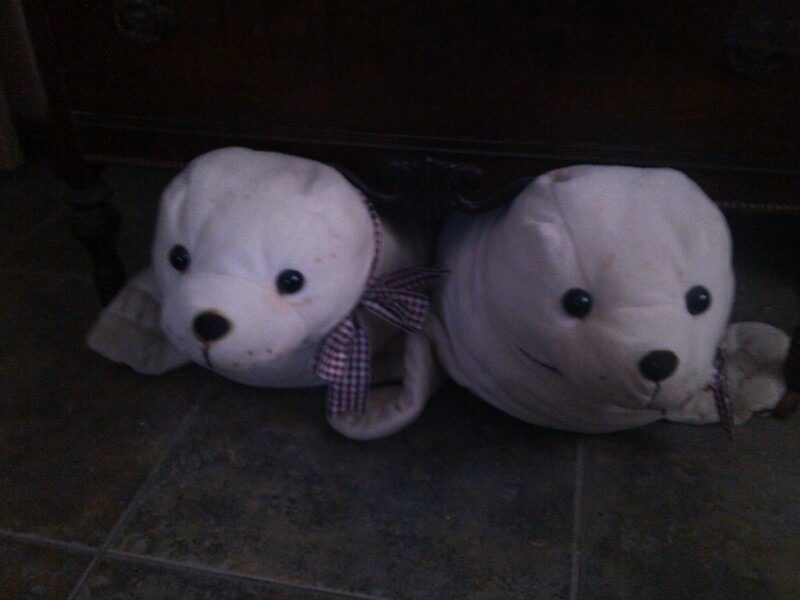 Of course, last but not least….the 2 familiar white SEAL PUPS get their place-of-honor: watching over everything from under my chest-of-drawers – – their home! My step-grandfather was a pleasant addition to our family when I was a child. We’d already moved to our ‘big house‘, as we dubbed it, when Gramma and Nick came for supper and I noticed her diamond ring. Of course I had to be the one to shout it out to everyone first! Since our house was brand new and my Mama had splendidly decorated it, the wedding was to be held in our home as we welcomed Nick to our family. Over the years, as we grew up, every once-in-awhile Nick would buy a new film cartridge and deem that the entire roll of film was gonna be used for ‘SILLY PICTURES’. What fun we had taking these photographs, usually to the dismay of my Gramma and Mama, who liked their pictures of all of us poised and smiling. Nick’s name was Harold Nicoson but everybody called him Nick. I’m rather sure that, other than family members and bankers, most people were unaware that his actual first name was Harold. I grew up in a teeny-tiny town with approximately 40 houses and my Gramma and Nick were next-door neighbors. Gramma was widowed first when Grandpa Joe died. Nick and his wife Amy were very close friends with Gramma, so when Amy got sick she asked Gramma to watch over Nick. Our family lived a couple of houses away from Gramma so we were accustomed to seeing Nick on a regular basis. His wife was sweet and quiet even tho he seemed gruff but nice, always hollering at the neighborhood kids as we rode our bikes up-and-down the road. When Nick was widowed, Gramma and some of the other neighbors made sure that Nick had meals to eat, otherwise he probably wouldn’t have bothered. Gramma had an old-fashioned front porch. I remember sipping tea and eating cheese-curls (Mama didn’t allow it but Gramma did!) with my Gramma and she’d allow me to bring any of my friends that I wanted also. Sometimes Nick would join us but I usually found an excuse to leave because I thought he was grumpy. Over time he softened and we started including him in our holidays because he didn’t have any kinfolk (that we knew of at the time). My Mama and Gramma were always good about not wanting anyone to be alone on holidays. Sometime during those years, Gramma and Nick must’ve fallen in love. I certainly didn’t see it happening, but then I was a child so how would I? It took much longer than a year for our new house to be built. Then Gramma, and Nick too once they married, moved into our old house (next door, incidentally) and their 2 small houses were sold. Nick never allowed us to call him Grandpa. That was okay, I had a fantastic Grandpa already. He lived a bit further down the road and also joined us for supper most evenings. So I felt blessed, as I know that Gramma did when she ‘got Nick‘. She always told everyone what a good man he was. With my Gramma he was very affectionate in a playful way, as well as amiable and kind. I don’t think she’d had this much FUN in either of her other marriages before! So she was finally getting to enjoy her older age and that made our family happy. He loved his 2 stepdaughters tremendously and quit being the grouch that I’d remembered, turning into an amusing, merry, cheerful step-grandfather that we loved having around! Then when all of us Grandkids had our own children….at last he allowed them to call him ‘Great-Grandpa’! And you know what? I do believe that he enjoyed that title! He and Gramma seemed to love being Great-Grandparents. During the 4-year period that my own 3 children and I lived in my Hoosier hometown (following divorce), it was an awesome experience for these 3 ‘Air Force brats‘ to stay in one place and to revel in the company of having a set of Great-Grandparents plus two sets of Grandparents living IN THE SAME TOWN! One of Nick’s most cherished photo that he took of me is one that I am NOT particularly fond of, nor will I share it. Whenever I’d come home from college, my Gramma would make a dessert for me that was aptly called ‘Cherry Delight‘ and it was my all-time favorite. Nick totally caught me by surprise as I had the big pan in front of me and was just preparing to serve it with a big spoon. He snapped the picture in such a way that it looks as if I’m about to dig in and eat that entire thing by myself! (this was before the days of being able to ‘crop‘ photos, yet he still managed to get the picture without any of the dessert plates or any other people in it) Of course he wanted to show the photo to as many folks that he possibly could! The photo above is probably my favorite of our SILLY PICTURES. 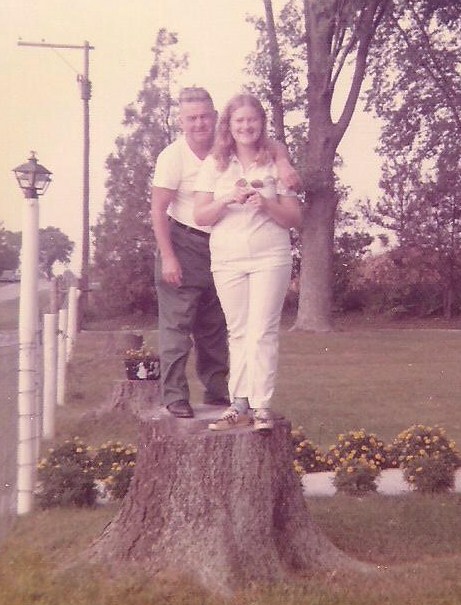 We’re standing atop a big stump while Gramma took the photo. Usually when Gramma would take the photos of the 2 of us, the pictures weren’t as silly or as ‘adventurous’. When Nick and I took turns taking pictures of each other, it wasn’t until about a week later when the drugstore would have the roll of film developed, that the real fun would begin! That’s when Nick would often, and I do mean OFTEN, get hollered at….first by Gramma and then by my Mama….when the photos of me doing crazy stunts like climbing onto the roof via the antenna (we both got into trouble for that one!) or holding onto the same side of the fence that the big angry bull was on or rolling in the dirt of Gramma’s carefully-tended garden. Good memories nonetheless with my stepgrandfather. I’m sure he’s told his pals in heaven all about our SILLY PICTURES already! We we fortunate to have Nick in our family. When Disney’s movie ‘The Little Mermaid‘ came out into the movie theaters in mid-November of 1989, I bravely gathered up the courage to take my little brood to see their FIRST MOVIE at a real movie theater. This was a big deal with a 4-year-old, a 5-year-old, and a 7-year-old….all at the same time! The oldest 2 of these 3 were extremely hyperactive, and NOT on Ritalin (I was firmly against it since they didn’t hurt themselves or anybody else plus were able to their schoolwork just fine). I knew that a trip to the movie theater was going to be quite an adventure that I had been putting off and delaying. But this was an animated movie and I was really hoping that it was gonna be a good once because it was Disney! Besides, how could I NOT take my kiddies to a Disney cartoon? Hubby and I hadn’t taken them to see ‘Who Framed Roger Rabbit‘ the year before, and we were glad that we didn’t because it was a bit risque and I don’t think that they’d have understood the content. But as it turned out, ‘The Little Mermaid’ was the PERFECT movie to be the FIRST MOVIE for them to see at a movie theater….so much so that we saw it several times! The 5 of us sat in the back row of our favorite theater in Ft. Walton Beach. We were almost the first to arrive and after we chose our seats, nobody else wanted to sit near us! We must’ve seemed undaunting, a family with a bunch of noisy and wide-eyed young-uns, so folks basically rolled their eyes and kept walking down the aisles to get far away! That was okay with us. What they DIDN’T know were the discussions that we’d had privately, at home, prior to coming to the movies: discussions about manners and respecting other folks and theater etiquette, etc.. All these folks didn’t know also that my children have always been extremely well-behaved. They may be noisy while awaiting the start of the movie because they’re as excited as possible, but as soon as the cartoon actually began they quieted down and enjoyed the delightful movie, clapping and laughing and cheering just as everyone else did! Our movie-going experience was such a hit that we did it again the very next weekend. We were also the last folks out of the theater (it takes a long time to gather all of our belongings plus it’s just easier to keep 3 little kids together once the crowds have ceased) By the way, several older adults stopped and commented about my children’s wonderful behavior! That movie opened to an $84 million box office during it’s initial release and was considered a HUGE success for the Disney company. It then made $211 million worldwide. It was a big boon for Disney cartoon movies. It even began an era known as the Disney Renaissance. Since that time Disney has been cranking out many, many wonderful animated movies. What a FIRST MOVIE that happened to be for my family too! It’s been a quarter-of-a-century ago and I am happily amazed at the influence that Disney movies has had on my 3 children. Both of my boys have worked in movie theaters, the youngest still does. All of my children have been Castmembers at Walt Disney World in Florida, the oldest 2 still are and have been for 10 years now! 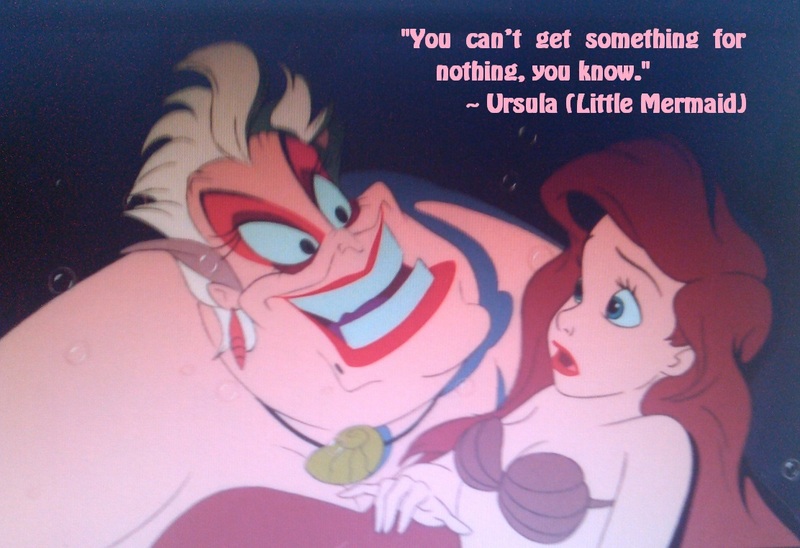 Could it all have started with ‘The Little Mermaid‘? Maybe! I still consider it to be the most BEAUTIFUL movie that Disney has ever made! Put this under the category ‘DID I REALLY SAY THAT’? My daughter & I tried the new Cheesy Bites Pizza for lunch at Pizza Hut. This is their latest promotion in connection with sponsorship of the ‘Teenage Mutant Ninja Turtles‘ movie. This photo is of our leftovers that we’ll be taking home. Of course, my daughter’s is the portion without meat since she has a been a vegetarian for 17 yrs! Not me, I love pepperoni on my pizza. Anyway, the Parmesan cheese shaker was empty and I cannot believe that I asked the server for more SPRINKLE-CHEESE!! Good grief! How old am I again? That’s what we called it when the kiddies were little….now they’re 29, 30, & 32! We both got a good laugh outa that, so did the waitress! A slip of the tongue perhaps? Or maybe it’s ME that’s entering MY 2ND CHILDHOOD. There aren’t many pizzas that my family DISLIKES, come to think of it. For home delivery, Papa John’s is my favorite. Mellow Mushroom is probably the yummiest in Orlando, Jacksonville, and Atlanta….so that kept us happy during our last couple of decades. My adult kiddies enjoy this all-you-can-eat cheap pizza buffet called Cici’s that I rather detest so they usually go without me! It’s popular though. Between my house and DisneyWorld there are actually more Cici’s Pizzas locales than there are McDonald’s and I find that unbelievable, plus the kids get a hefty Castmember discount. My daughter also enjoys stopping at Little Caesar’s on her way home to order pizza-to-go. I still prefer Pizza Hut. So if I’m paying for my family, then it’s gonna be Pizza Hut! However, there is a major exception. If we’re in my small Hoosier hometown then we’ll be going to Pizza King! No doubt about it! Cheese, cheese, cheese, and more cheese please! I learned that cheese can make soooo many things much more delectable. When my children were very small and wouldn’t eat their veggies, of course I would add a bit of cheese to trick their tastebuds! They’d eat just about anything if cheese were on it or in it. I taught other parents the same ‘helpful hint’ too, also with successful results. My kiddies are now adults and do enjoy trying all kinds of cheeses and usually have a varied assortment in the fridge. I may not hear a “Thanks, Mama” but that’s okay….I take responsibility anyway! Well, I notice that I need some more SPRINKLE CHEESE here at home, so I’d better put Parmesan-Romano cheese on my shopping list (even my ‘shopping list’ is on my phone nowadays, I’d never have guessed that a decade ago!). Nobody in the grocery store will know what I REALLY call Parmesan cheese, eh? Hmmm, maybe my daughter better not take me to Kentucky Fried Chicken….I might absent-mindedly order ‘chicken-with-a-handle‘ (what the kiddies called drumsticks)!!! 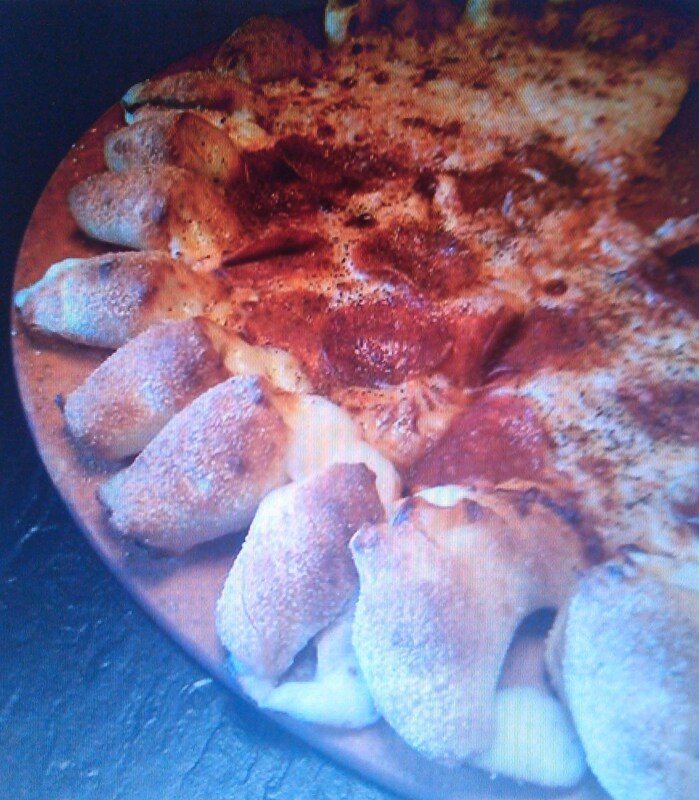 Oh, and by-the-way, that new pizza at Pizza Hut was yummy! Sometimes we just have to laugh at ourselves! No, not because nobody else does because I’m rather sure they do….but simply because we often realize that we find ourselves doing the oddest little things as we get older that we never would have considered a bit amusing 2 or 3 decades ago. Unless, of course, we per chance saw some other old stinker doing something similar and then we’d probably be snickering! 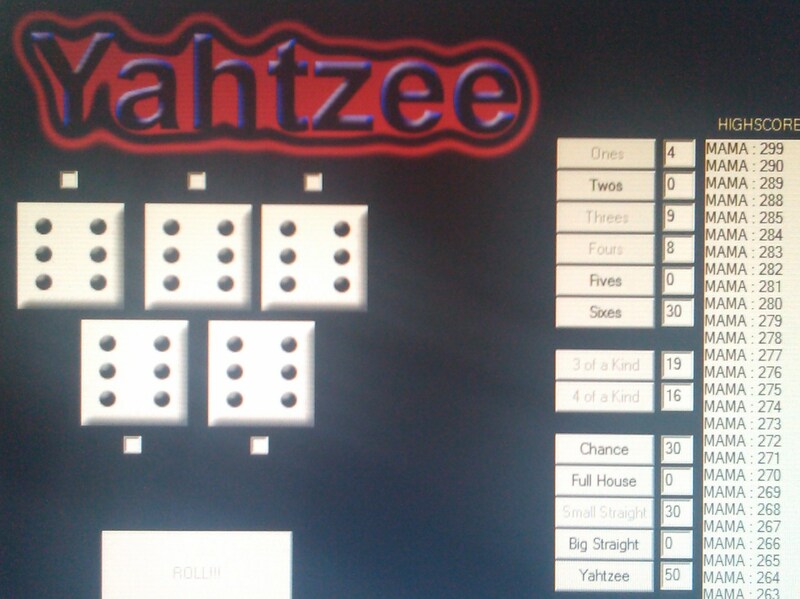 Simple silly things such as still HOLLERING “YAHTZEE” very loudly and then realizing that I’m home alone playing the game against the computer! But it is most definitely a HABIT that’s become so ingrained into any avid Yahtzee player that it’s quite difficult NOT to shout it out when those 5 little dice come up with the same numbers of dots and my glee is still apparent nonetheless. Nowadays the youngsters don’t seem to get excited about the games that I like: Yahtzee, Scrabble, Battleship, Solitaire, Chinese Checkers, and Mahjong. My son installed them on my computer for me, plus Bejewelled and Minesweeper, and those cute little furry Chuzzles. It makes me both glad and sad. Glad that I can still play these fun games and sad that now the kiddies think that they don’t have to ‘play games with Mama’ anymore. They’d rather play with the games that exercise their thumbs! Because of my Neurological disorder, Scrabble and Mahjong are games that my Dr. suggested as a daily activity that’d be good to exercise my brain. Imagine that, playing Scrabble and messing with words to help my disability….gotta love it! I do enjoy Mahjong too. I’d originally learned the basics of the game from some Asian moms when I was a college student in Hawaii, but I could NOT keep up with them AT ALL. They were amazingly fast with those tiles! It was fun just to be able to watch them play and to listen to the tiles quickly making the click-click-click sound until the game finished, and the ladies were fiercely competitive too! Mahjong now helps me with my brain function, especially the with memory. I have a major issue with the ‘scrolling’ of the computer and the ‘back-and-forth’ eye movement because my Vertigo/dizziness often making me nauseous; so this greatly helps in keeping my mind/brain active. Whoever would’ve thought, eh? When I was a young girl, Mama and I got a big kick outa playing games with my Gramma Pearl. Gramma always won. Not sometimes, not usually, but ALWAYS! Sometimes my brothers would play too. Gramma still won. Sometimes my stepdad and Gramma’s hubby would play. Gramma, of course, would win. We never ever LET her win either. Her specialty was Chinese Checkers and Yahtzee. Nobody could beat her at those games. Her neighbors tried. Her nieces and nephews tried. Her grandbabies and great-babies tried. Nope….Gramma won. Even when my Gramma was 90-years-old and was in the nursing home….she still challenged and was challenged by the nurses and other residents and visitors but my awesome Gramma was good at her game. If she was playing Yahtzee, then you can bet that it was gonna be MY Gramma Pearl that would be the one HOLLERING “YAHTZEE”!! Now that Gramma has moved on to her heavenly home, my own Mama is the family matriarch. I suppose she has ‘pretty much’ taken on the the role of usually winning at Scrabble (she and my stepdad play the game nightly) but we all takes turns at winning the other games! So there’s hope for me yet to be the Family Champ at SOMETHING!! !